Three people have died as winter storm Eleanor swept across most of northern Europe, causing widescale disruption. A skier died in the French Alps and 15 others were injured elsewhere in the country, four of them seriously. Two people were killed when they were swept away by a huge wave on Spain’s northern Basque coast. 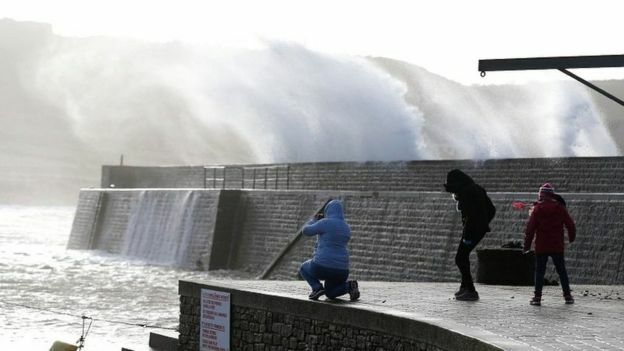 The storm, which hit most of northern Europe after battering the UK, has also cut power to tens of thousands of homes and affected transport. Winds reached up to 100mph (160km/h) in the UK and 147km/h (90mph) in France. Storm Eleanor is the UK’s fifth named storm of the season. In northern France, the storm cut power to more than 200,000 households and Eleanor is set to move to other regions throughout the day, including Corsica. Air travel was also disrupted in the capital, Paris, and in the east of the country. In Paris, the Eiffel Tower was closed because of the strong winds. The city’s parks have also been closed until the storm dies down because of worries over falling tree branches. A skier was killed by a falling tree in Morillon, in the Haute-Savoie region of eastern France. 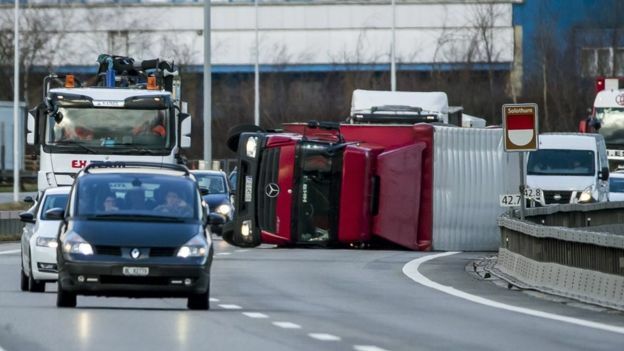 In Germany, the storm – named Burglind there – has swept over much of the country. 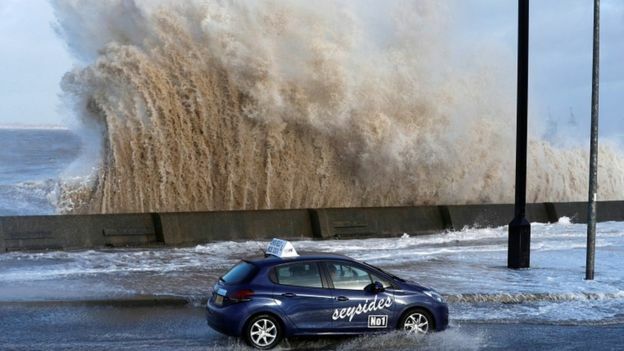 It packed gusts of more than 120km/h (70mph) in the west of the country and led to transport disruption, reports say. 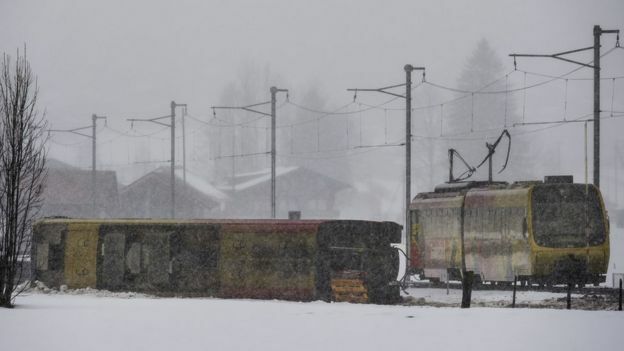 Switzerland has also been badly hit, with some 14,000 homes without power, and several injured after a train was blown off its tracks. The high winds left several people stranded in a ski lift in St Gallen canton, overturned a light airplane in Stans and snapped the 13m (42ft) high Christmas tree in the capital Bern, Reuters news agency reports. 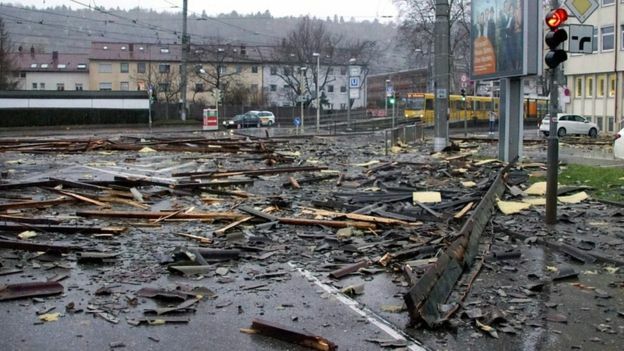 Meanwhile, record wind gusts of 195km/h (122mph) were recorded on Pilatus Peak near the Swiss city of Lucerne, broadcaster SRF reported. Belgium was put on “orange” alert, the third of four warning levels, with officials urging people to be cautious when going out because of tree branches and other flying objects. In the Netherlands, gusts of more than 110km/h (68mph) were recorded as hundreds of flights were cancelled at Amsterdam’s Schiphol airport. One person was hit by a falling tree, and several main roads and train lines were also closed. Dutch authorities have, for the first time, shut all five major sea barriers to prevent flooding, as large areas of the country are below sea level. In the UK thousands of homes are without power and travel has been disrupted after Storm Eleanor hit there. The Met Office recorded gusts reaching 100mph (160km/h) overnight on Wednesday with a weather yellow warning still in place for Wales, England, most of Northern Ireland and parts of southern Scotland. In the Republic of Ireland, 97mph gusts were recorded, and there was flooding, travel disruption and damage to buildings.